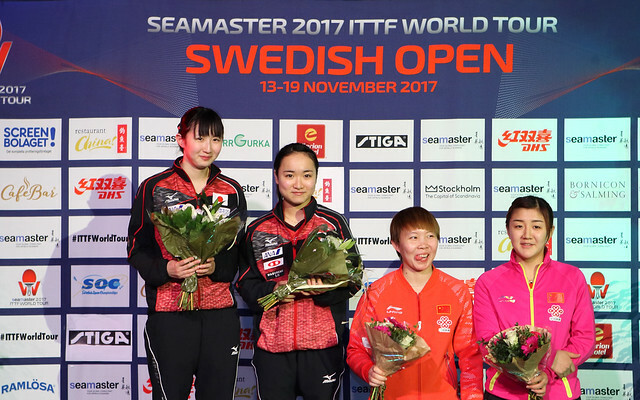 Success for the top two seeded pairs at the quarter-final stage of the Women’s Doubles event on the morning of Friday 17th November at the Seamaster 2017 ITTF World Tour Swedish Open in Stockholm. The facts read that Hong Kong’s Doo Hoi Kem and Lee Ho Ching, the top seeds, secured a penultimate round place; just as they do for Japan’s Hina Hayata and Mima Ito, the no.2 seed. However, the facts do not reflect the drama and the agony. Hina Hayata and Mima Ito experienced few problems; in three straight games they accounted for Luxembourg qualifiers Sarah de Nutte and Ni Xialian (11-3, 11-9, 11-8). Comfortable for Hina Hayata and Mima Ito, for Doo Hoi Kem and Lee Ho Ching it was the opposite. Against the partnership formed by Spain’s Maria Xiao and Canada’s Zhang Mo, the Hong Kong duo trailed by two games to one. Down 1-4 in the fourth game they called “Time Out”. It appeared the break was in vain; Maria Xiao and Zhang Mo establish a 7-3 lead and at 10-7 held three match points. All three were saved before on their second attempt, Doo Hoi Kem and Lee Ho Ching secured the game and progressed to win the fifth (9-11, 11-13, 11-5, 13-11, 11-7). Almost an upset; there was one surprise but only quite minor, Chinese Taipei’s Chen Szu-Yu and Cheng I-Ching, the no.5 seeds, combined to beat Korea’s Jeon Jihee and Yang Haeun, the no.4 seeds (9-11, 11-9, 11-8, 11-6). Success for Chinese Taipei, there was also success for China; Chen Meng and Zhu Yuling, the no.3 seeds, ended the hopes of the combination formed by Slovakia’s Barbora Balazova and the Czech Republic’s Hana Matelova (11-4, 13-11, 13-11). At the semi-final stage Doo Hoi Kem and Lee Ho Ching meet Chen Meng and Zhu Yuling; Hina Hayata and Mima Ito oppose Chen Szu-Yu and Cheng I-Ching.